My brave one’s awe and amazement was just the prelude to the magnitude of what I was about to encounter and a lesson of which my heart is still discerning. He beckoned to me with urgency to emerge from the comfortable warmth of the car. I pulled my coat in tight and made my way across the sand- something I had not done in a very long time. In that moment- in that very moment- I was taken back to the a time when my world stopped- the moment that everything just stopped moving, stopped breathing and everything just froze. After she died, we would travel to the place where sandy earth and water collided. It is where, in the midst of crashing waves and tidal breezes, we are healed and restored and have permission to be alone in our thoughts. After she died, we would make the bundled up trek to the ocean’s edge, not thinking twice of the salty, spitting waves and biting, bitter wind we were about to encounter. We would wander the shores and I would pull low my hat and wrap tighter my scarf. As we walked, I would contemplate heaven, wonder what was it like and plead for a simple sign or a quick glimpse. An unaffected bird, bobbing on the frigid water would catch my attention and I would be captivated by the thought that it was a clue to something of which I was supposed to understand. I would pull lower my hat and wrap tighter my scarf and consider how would we ever restore our balance and rebuild our life. As my mind would ponder, the salty spray and the biting bitter winds would pelt my body. While they had the power to numb, they would awaken my soul and remind me I was alive. Their brutal force awakened my heart to the reality that it was in fact still beating. Somewhere in the space and time since she died and now, our hearts have begun to heal and our lives restored anew. There is no exact time I can pinpoint and say, “it is done” or “all is now well.” Rather, over the space and time since she died, our hearts continue to be healed in simple moments and in solitary ways. Our breathing is restored as we encounter beauty and awe that inspires and in the sweet simple moments that remind love is far greater and more powerful than death. In space and time, we have learned that we will likely have moments that land deafening blows and there will be times that will hurt. And while there was a time we felt pain would never let go of her crushing grip, we have learned that broken hearts can heal but will always leave a space that is sensitive and susceptible. When he beckoned me from the car, I pulled my coat tight, and realized somewhere along the way, I stopped making the trek to the winter waters and found comfort by the fire and the quiet that surrounded. 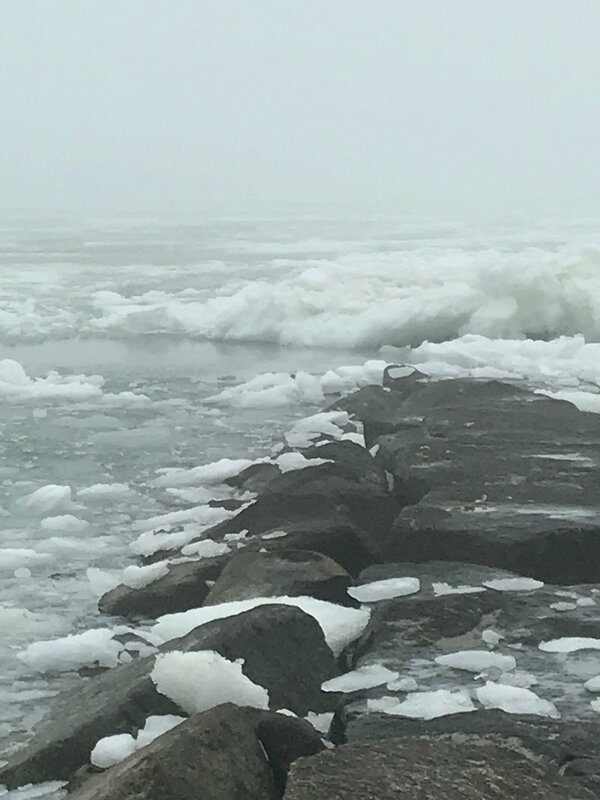 I left the comfortable warmth of the car and made a trek I had not made in a very long time and encountered waves that had actually frozen. I encountered a moment frozen in time. Isn’t this the case for many of us? Isn’t there a moment when the world seems to stop? A moment when Everything. Just. Stops. Stops Moving. Stops Breathing. Everything freezes in place and you gasp for breath and then just as quickly as the moment came, it goes. You move because the force of that which surrounds you urges you forward. The biting winds, the pelting spray, the bird bobbing effortlessly in the frigid waters remind that life will continue despite what your heart feels in that moment. I followed my brave one out on the jetty and while the forces stood frozen around us, there lied a small little pool of water beside us. A tiny small pool of water survived the freeze and would eventually grow and release the waves to continue their journey to the place where the sandy earth and water will collide.